Where do we go from here now that we know that Special Needs Vouchers are a part of the governor’s budget proposal? There is still time to take action. The budget is not set in stone, and the legislature has an opportunity to make changes. Please take time to contact your state representative and state senator. Email, call, or even schedule a legislative visit! The message remains the same: special needs vouchers do not belong in the budget. Such a huge policy change needs a hearing in a standing education committee so the public can voice its opinion. You can find contact information for your state legislators here. Check out our Take Action page for a sample email. “For every success story of a voucher school there is a failed story of a voucher school. For every student that has thrived in the voucher school, there is another story where a voucher school failed a student. Yesterday’s press conference was a success! A huge thank you goes out to advocates across Wisconsin! It was truly amazing to see families gathered together to spread the Stop Special Needs Vouchers message. We know that many families were not able to make it yesterday. Please know we appreciate your support and the work you are doing! Our speakers shared public school success stories from elementary school to college. One by one they spoke from the heart and asked the governor to reconsider including special needs vouchers in the 2013-2015 budget proposal. Afterward, a small delegation walked a letter from Stop Special Needs Vouchers to the governor’s office. If you would like to watch video of the press conference, full coverage can be found here at WisconsinEye. Check out our Voucher Information Links page to read press coverage of this event. 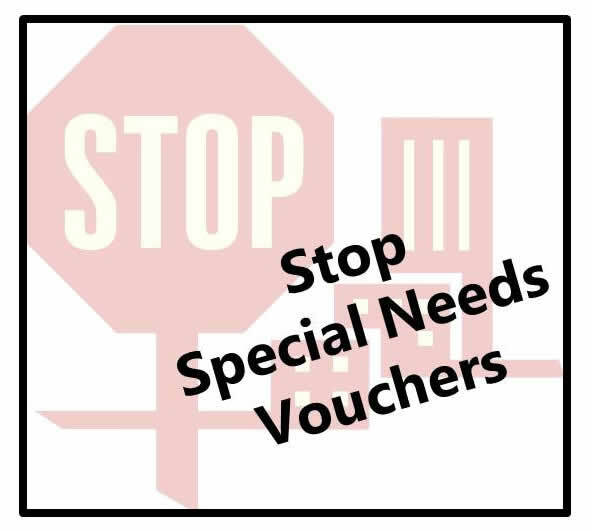 We are writing today as the members of Stop Special Needs Vouchers, a statewide parent-run organization committed to promoting quality public school choices for all students and preventing harmful special needs vouchers. With families across the state of Wisconsin, we believe in the promise of quality public education for all students, both with and without disabilities. Through the education of Wisconsin’s children in our strong public schools, the people of this state are investing in the future. We believe the special needs voucher proposals which failed to pass in the 2012 legislative session would diminish that promise. These vouchers threaten both students who would use the vouchers to attend private schools and those students who remain in public schools. We were dismayed to hear the news yesterday that a special needs voucher proposal is to be included in the 2013/2015 state budget proposal, and we respectfully request that you reconsider. Families who use special needs vouchers forfeit their parent and student rights and protections guaranteed in public schools by the Individuals with Disabilities Education Act. Should a voucher school fail to provide an adequate education with appropriate supports, the family has no legal recourse to obtain necessary services and supports. Their choice is then limited: remain at the private school that does not support their child, or return to their local public school that receives no additional funds for that child. While public schools are required to accept all students, regardless of the severity of any disability, voucher schools would have no obligation to accept any given student. Special needs vouchers would go to students with milder disabilities that are more easily accommodated, leaving students with moderate and severe disabilities in neighborhood schools drained of funding for shared resources, such as therapists and special education teachers. Special needs voucher programs in other states have experienced fraud, as well as increased segregation of students with disabilities. We are also concerned that limited requirements on staff credentials and programming would open the state to “double-dipping” by Medicaid providers. Special needs vouchers are not guaranteed to cover the entire tuition at a private school. They would be more accessible to wealthy families than to families of lesser means. There is no family income cap for using the voucher; they would be distributed regardless of financial need. Furthermore, no established statewide disability group in Wisconsin has asked for special needs vouchers, and none were consulted about any voucher legislation to be introduced in 2013. Governor Walker, we ask that you remove special needs vouchers from your state budget proposal. Such a wide-reaching policy change affecting some of our most vulnerable students deserves a statewide public debate and a full public hearing in a standing education committee. We thank you for your consideration, and we look forward to expressing our concerns with you in person. PARENTS OF CHILDREN WITH DISABILITIES TRAVEL TO MADISON TO TELL THE GOVERNOR: SPECIAL NEEDS SCHOLARSHIPS ARE BAD NEWS FOR OUR KIDS! Madison, WI – Parents from across Wisconsin traveled to Madison today with their children with disabilities to tell Governor Walker a proposal in his budget is very wrong for their kids and to ask him to remove it immediately. The Governor announced yesterday that he will fund a special needs voucher program aimed at students with disabilities. Parents say the Governor was pressured by out-of-state organizations to include this harmful program without hearing from Wisconsin families about negative consequences. They are asking the Governor to remove the provision and to instead allow for balanced public debate on the issue within a legislative education committee. Parents and people with disabilities from as far away as Dunn, Outagamie, Kenosha, Eau Claire and Milwaukee Counties were either at the event or represented by their letters and stories. Parents have a range of concerns about a voucher proposal, including reports of rampant fraud in other state special needs voucher/scholarship programs. Parents say they question why legislators and the governor would want to use tax dollars for a program similar to Florida’s in which parents had been duped by storefront schools and fancy brochures. In some cases, students left schools without earning necessary credits and even suffered abuse. Parents also are concerned about the potential for double-dipping by predatory providers in Wisconsin who might see lucrative opportunities to combine vouchers with Wisconsin’s Medicaid programming for children with disabilities. After sharing their stories parents delivered a resolution to Governor Walker, asking him to remove special needs voucher policy from his budget. Special education law requires that a child with a disability receive a Free and Appropriate Public Education (FAPE). An IEP is a legal document listing, among other things, the special educational services that the child will receive, provided by staff with certain defined credentials and training. Following the 2:30 press event parents planned to visit the Governor’s office to make a final plea for special needs vouchers to be removed from the state budget. Governor Walker gave an interview with the Associated Press in which he outlines his plans for education reform and funding in Wisconsin. Among his proposals for the 2013-2015 biennial budget is a measure to allot $21 million in grants for students receiving special education services. A proposal for those special needs vouchers passed the Assembly last session, despite broad opposition from the state Department of Public Instruction, disabilities rights groups, and the state school boards association. It did not pass the Senate. You can find the full article here at the Wisconsin State Journal. With this announcement, our call to action has changed. At this time, we need to ask the governor to remove special needs vouchers from the budget. We have updated our Take Action page to reflect this new call to action. Please join us tomorrow, February 18, at the capital for a press conference to deliver our Stop Special Need Vouchers message. Details can be found in this blog post. SPECIAL NEEDS SCHOLARSHIPS ARE BAD NEWS FOR OUR KIDS! Parents and children with disabilities from across Wisconsin will gather in the Capitol on Monday, February 18 to tell Governor Scott Walker to keep special needs vouchers for students with disabilities OUT of his budget proposal. The Governor will deliver his budget address on February 20. Many believe he is being pressured by out-of-state lobbyists to include a special needs scholarship proposal, which could be harmful to students with disabilities and local school districts. Specifically, families are concerned that voucher funding mechanisms would harm their children in the public schools by draining monies from their local districts. In addition, parents who use the vouchers would lose essential rights in private schools where basic safety protections are not in place and quality of education is not guaranteed. At the family-organized February 18 Capitol event, parents from around Wisconsin will share their stories, introduce their children with disabilities and discuss their concerns about placing a special needs voucher proposal in the budget. Following the press event, parents and children with disabilities will deliver a message directly to the Governor’s office. National lobbying groups have been busy in Wisconsin working to have Governor Walker add Special Needs Vouchers to the 2013-2015 state budget. This kind of sweeping policy change does not belong buried in a state budget. Families, educational experts, and citizens deserve the opportunity to weigh in on such a large-scale change to the way our state funds education and approaches supporting students with disabilities. If Special Needs Vouchers are included in the state budget, there will not be time for community input. Check out our Take Action page for a sample email, or use DAWN’s email generator found here. The governor’s budget will be released on February 20 – the time to email is now!